Each round, players take turns placing their 2 or 3 action markers on any the 6 different actions they wish to perform that round. There are only 2 spaces for action markers next to each action so players must try to secure the actions they want before opponents fill up the spaces. After placing action markers, players take turns executing one of the actions where they have an action marker. Actions can be executed in any order and timing is very important as an opponent executing the same action ahead of you may take the item you wanted. For example, 2 players have selected “buy resources” but the second player to take this action will only be able to pick from the resources that are left by the first player that took this action. Inventing devices earns the player cash and/or VPs, and the inventing player also earns income when any other player manufactures a device that they invented. Sometimes players can manufacture fake versions which do not benefit the inventor, so an inventor can patent their invention to ensure they still get rewarded even when fake goods are manufactured. As the game progresses, players invent bigger items which means the VP scoring potential grows too as the rewards for manufacturing bigger items is greater. 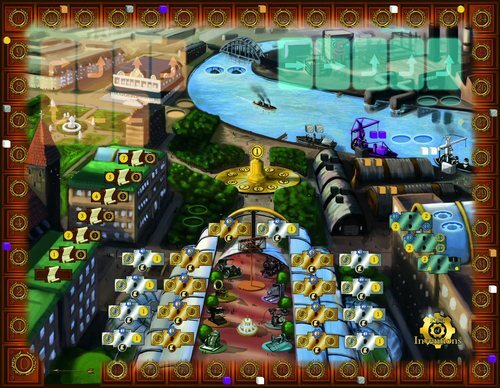 Players score VPs during the game but there are also bonus VPs at the end for things like the player that spent the most cogs on inventing devices, the player with the most patents, and so on. Overall, Era of Inventions may sound very dry but it delivers a superb game. The game mechanics combine really well to deliver a tense and challenging game where you are always balancing earning and spending resources whilst racing against your opponents too. The action placement system works really well. The limited spots in which to place your action markers makes you think carefully about which actions you need to combine; however, knowing that players can choose which order in which they use their actions adds tension because just placing an action marker doesn’t mean you’ve secured what you need yet so you must judge when you think other players will use their actions. This is the key reason why I liked Era of Inventions – choosing the actions is tough, and deciding their order is too. There is a clever bonus action system too which allows players to spend bonus action discs (which can be bought) to perform a small version of any action immediately after their regular action. This extra action can be really useful especially if you didn’t secure the action you wanted to perform this turn, plus it can interrupt other players’ plans which adds to the tension. The factories that can be built and the inventions that can be manufactured each round are shown on cards and these change each round. Another aspect I really like is that all players can see several of the factory/manufacturing cards that will be available in the next round so they can plan ahead a bit. When starting the game, I thought factories would be important as you can produce multiple resources from one factory production action. However, as much as I tried, I just couldn’t get the right resources together to buy many factories. In the end, I started out well but couldn’t maintain my momentum because of a shortage of resources – when I play again, I shall be slightly more patient and resist spending resources during some turns so I can buy bigger items (like factories) later, rather than use almost every resource on every turn to score smaller continual VPs. The one aspect I don’t get is why players receive free resources for landing on specific spaces of the score track and not on every space. It just seems a bit random as it’s difficult to aim to earn a specific amount of VPs so you can gain a useful but minor benefit. It can just as easily extend the leader’s lead as it can allow the player in last place catch up. I think it might be better with a possible free item on every space – or maybe just allow players apart from the leader to receive these benefits. It’s a small item though. 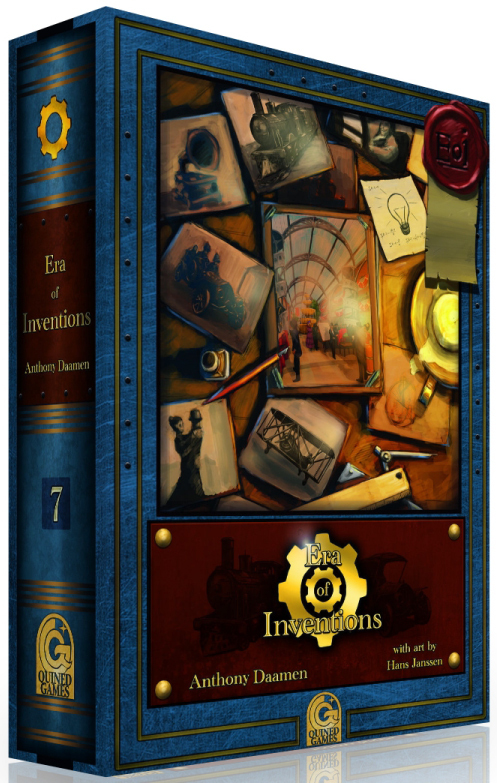 Era of Inventions is one game that I wish I had bought at Essen as it turned out to be one I would like to have in my collection. I’m looking forwards to playing it again. We played with 3 players and I’m interested to see how it will play with 4 or 5 players seeing as players get fewer actions and there are no extra spaces for action discs – I think it will be very entertaining if a little brutal. 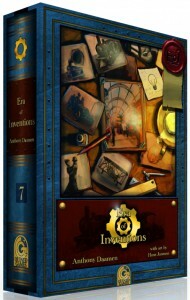 This entry was posted on Tuesday, December 14th, 2010 at 10:17 am	and is filed under Board Game Review, Board Games, Era of Inventions, Essen Spiel 10. You can follow any responses to this entry through the RSS 2.0 feed. You can leave a response, or trackback from your own site.